Search Results for "horse run"
Tracking horse training inside the fence. Rider warming up horse outside with run inside the fence on a sunny cold day. Horses run on meadow. Horse herd near green field. Chase the horizon. Animals on vastness of nature. 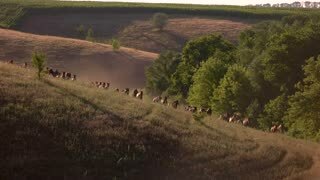 Large group of horses runs. Herd and men on horses. Spanish stallions on a meadow. Animals are trained for racing. Horses run on the meadow. Two horsemen chase herd. Shepherds at sunrise. Don't stop moving forward. 1950s: Multiple horses run in pasture. Horses stand behind fence. Two horses’ heads. Horses run in a circle in circus. Police men ride horses on crowded street. Horses with carts run in race track. 1950s: Two young horses run around in the pasture. A young horse runs. Man drives mower near a fence. Young horse stands still, walks slowly and runs. Man mows the grass. Horse riding school. People are riding horses in circle at riding school at evening. 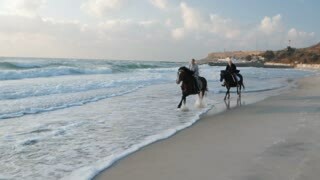 Horses run by the sand. There are several horses of chestnut and grey colors. The camera is hand held while the horses run on the path. 1950s: Young horses eat grass. Head of young horse that eats grass. A horse rolls on the ground. Horses cross a small brook. 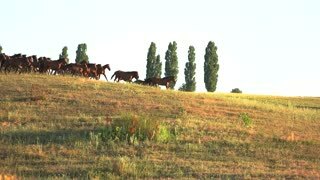 Young horses run in the pasture. 1950s: Men on horseback with group of horses. Horses running. Man and boy on horseback watch horses run. 1950s: Horse’s head. Man sits on a tractor, pulls rope that closes gate behind and drives away. Man drives mower behind a fence. Young horse’s head over a fence. Two young horses run. 1940s: Horses run over hills and fields. Horses wander in field. Car approaches sign on rural road. 1960s RUSSIA: Nicholas II marches past military standing at attention. Men ride horses. Horses run and jump. Riders are preparing for competition on horseback trotters. Riders control the movement of horses harnessed to sports strollers. Horses run trot. Sunny summer day at the racetrack. Video slow motion. 1940s: Rodeo cowboys stand with horses, a black horse starts to run. Cowboys stand with horses. Cowboy on horse tries to grab horse that goes wild. Cowboy pushes down horse's head. Cowboys and horses.